Brothers Peter and Martin love living at Popcorn Hill. It's an exciting place for young boys to have adventures. What else could they want? A dog of course. Not only can the dog accompany them on adventures but it can protect them from the eerie laughter they hear of a night in their room. When their parents finally consent, they head to the local humane society in hopes of adopting the biggest dog ever. Their plans quickly screech to a halt when their father won't allow them to get the big dog they want and so they relent and get a smaller variety. While the boys are happy to have a dog, they still wish they could have gotten a different dog. 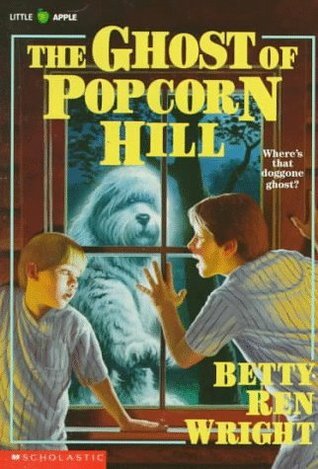 Their frowns quickly turn upside down when a stray sheepdog, a much bigger dog, shows up.The Ghost of Popcorn Hill was a quick and pleasant read. My seven-year-old daughter read it first. She expressed her joy about the dogs. She questioned why the boys weren't happy with the dog they adopted so the moral of this book is easy for younger minds to grasp.I was happy with how the book ended. I won't give spoilers but it was nice to see the lesson the boys learned and how they faced their fears in order to help someone in need. I'd happily get the other books by this author for my daughter to read. Review copy provided by NetgalleyThis is the story of two brothers that really want a dog and exceedingly uncomfortable with ghosts in their new home on Popcorn Hill. While I am not an expert when it comes to ghost stories, I know that this is relatively mild as ghost stories go, and it probably would be just fine to share with a younger audience even if they are easily frightened. I felt like the younger of the two brothers, Peter, was irritatingly difficult and the mother in the story had the strangest imaginable fear of burglars, but the story was simple and enjoyable for the most part. The boys encounter a ghost in their bedroom and spend much of their time chasing a mysterious sheepdog while neglecting the dog they just received as a pet, but something about the story rang true. All in all, this is a good choice for people looking to introduce the ghost story to children without scaring them. Nothing about this story would be upsetting to a younger audience. While it wouldn't be the nest choice for an older audience, for younger readers this is just about right. I recently received this book from Netgalley in exchange for an honest review. It looked like a cute republished children's books and since it had a dog on the cover I couldn't resist. As expected with an adult reading a children's book, I read it all in one sitting. In the book, the kids are wanting a big dog, but due to the budget and the size of their home, they end up getting a smaller dog. The book tells the story of how they boys get over their disappointment, with some drama and paranormal activity thrown in. This would be a great book for a 2nd or 3rd grader and is considered a shorter chapter book. There are a few illustrations throughout which are wonderfully done and set me in mind of a simpler time. If you have children or love dogs, then this would be a great book to pick up for your home. Although I read it on my Kindle, I think the book and the illustrations make for a much better physical copy read. When brothers Peter and Martin first hear the spooky laughter coming from the corner of their dark bedroom, they comfort themselves with thoughts of the family dog they’ll be getting the next day. Although the boys hope for “the biggest dog in the whole world,” their practical parents bring home medium-sized, rambunctious Rosie, who proves to be little help in keeping away their ghostly visitor. So the boys pin their hopes on the big sheepdog they’ve seen in the neighboring orchard, trying to lure him into their room—with unexpected consequences. This is a solid transitional book for kids just making the jump to chapter books: short chapters, generously illustrated, just enough intrigue to keep things rolling along. Also great for those kids looking for something spooky, but who aren’t quite ready for Wright’s more intense ghost stories. Offer this to fans of Marion Dane Bauer’s coloful ghost series. This is an adorable book about two brothers wanting a big dog to pull their Wagon and finding out that even the 'wrong' dog can be pretty special. It is also a ghost story about a lonely man and an equally lonely sheepdog. Filled with great characters and a very good message, this is a superb way to start kids reading chapter books. Loved it. Martin and Peter Love their new house on Popcorn Hill. They like the stray sheepdog that walks around thier home even more But one night they hear ghostly luaghter at night, they find out everything on Popcorn Hill may not be what they think it is Will they met a couple of ghosts? If you read it you will find out! Brings Back MemoriesThis was a really cute story. I read this when I was in 4th grade and I still like this book. It is a real "feel good" story. You will sail through this short book and love it! Betty Ren Wright Karen Ritz - Betty Ren Wright is an author of children's fiction including The Dollhouse Murders, The Ghosts Of Mercy Manor and A Ghost in The House among others.She was born June 15, 1927 in the U.S. and she is currently working on her 26th novel. Ms. Wright lives in Kenosha, Wisconsin, with her husband, George Frederiksen, a painter.